The number 1 question our friends and family asked us when we were getting ready for 5 month Euro-moto trip was how do we pack and what will we bring? I will start by saying I am far from a fashionista… so if you are into high fashion and cannot travel without a pair of heels and full jewelry box, then this is not the place for you to get advice. For everyone else, here are my suggestions. Clothes I selected for 5 month, 3 season, 10 country Euro-Moto trip. All pieces are interchangeable and can be layered for different looks. • Exofficio Storm Logic Coats – They can be layered underneath, and/or on top of. Inside you find a number of pockets (passport, cell phone, wallet just to name a few), and they roll up inside a pocket on the lower backside to create an awesome travel pillow. • Eddie Bauer self packing raincoats. • I always bring gloves and end up buying a hat, the opposite for Daryl. No jeans! They are heavy, tough to wash on the road, and get stinky quick. • I packed 2 pairs of pants, both by Columbia. 1 hiking pair, 1 slack style. I look for pants with discreet zipper front pockets that fit my passport and are water repellent. • Daryl selected 2 pairs of Eddie Bauer Travelex pants. They also have a discreet zipper pocket and are water repellent, and 1 pair Columbia hiking pants that convert to shorts. •2 Dresses – Columbia’s Marakesh Maven dress is my favorite – I have in three colors and decided on the black one for this trip. It is UV protective and has pockets. The other dress is a no-name synthetic blend. •1 Black cotton-synthetic blend skirt by Patagonia. •Daryl opted to not bring a dress or skirt on this trip. •We each selected four or five shirts that coordinated with all bottoms. •For me: a t-shirt, Eddie Bauer dressy tank shirt, a long sleeve Cuddleduds layering shirt, light merino wool sweater (bit the dust week 3!) and a blouse. •For him: 2 shirts with long sleeves he can roll up, 1 short sleeve, and 2 t-shirts. His button down shirts are all Eddie Bauer Travelex. •Cardigan: I admit that I have a cardy problem so I decided on a heavier Exofficio one and 2 light weight 3/4 sleeve no-name ones. We all have our weaknesses, sweaters are mine. Daryl selected a cotton-synthetic blend sweater and a microfleece. • We always travel with lounge pants and a t-shirt. I am realistic about how many pairs of each I need. I like to go four days before needing to wash them. • 5 pairs of each (plus a pair of black leggings and no-see-um socks for me). All Smartwool socks and Exofficio undies. The undies dry super fast and are very light. • For me: second bra, sports bra, black leggings, and no-see-um socks. • For him: running shorts and boxer style speedo. This is always difficult. How do I know how my feet are going to feel in a month? The best part is that you don’t, which means you give yourself the green light to buy a fantastic pair of leather shoes in Italy! • Clarks Originals: we both have them in suede and LOVE them because they are great for walking but can be dressed up and they fold into themselves almost flat. I have the Faraway Field Oxford and Daryl has the Desert Ankle Boot. • Causaul & Beach: I have a pair of Keen Sienna Canvas machine washable mary janes, Daryl has a pair of machine washable Sanucks. I also packed a pair of Born leather shoes which just would not break in so I left them along the way somewhere. • Hiking shoes: we always travel with hikers because a. we enjoy trekking, b. you can go for a run in them, and c. there are days when your feet just ache from traveling! 3 oz. is more than enough! If you don’t believe me, put your favorites in 3 oz. tubes now and see how long it takes you to go through. You can pretty much purchase anything anywhere (ok, remote places maybe not, but where ever you are flying to in order to get to where you are going…) so I keep it simple. • Detergent, face wash, lotion, and sunblock (my skin is super sensitive and holds me over until I can find a local product that will work). • Enough toothpaste to get us through a few days. • Makeup: I bring the bare minimum. • Dry eye/allergy eye drops. • Benadryl, gas-x (I always take 2 as soon as I board a flight), Dramamine, Sudafed, cold & sinus, Pepto Bismol (tabs), Tylenol (travel pack), and Alieve. • Vitamins – I take a variety daily so those I tend to bring a bit of. For the 5 month trip I packed about 1 months worth. • The obvious – cell phones and chargers, laptop, charger, mouse, kindle, external battery, plug adapters for destinations (tip – if your laptop plug is 3 prong, make sure you get an adapter that takes 3 prong! ), headphones, and gps (if traveling by moto like us or car – phones can be unreliable and costly to use as gps when traveling internationally). Our favorite item currently is the Anker 2nd Gen Astro 3 portable charger – when fully loaded we get about 4 full charges on our cell phones from it! • Clorox wipes, wet ones, hand sanitizer, pashmina, eye mask, ear plugs, neoprene wine bottle tube, and phrase book(s) (though with T-mobile now obsolete as I always have data and access to google translate). For this trip we added travel fly fishing gear and a hammock as well as a small pack of vision therapy supplies I use regularly. Art supplies neatly packed inside a toiletry bag. 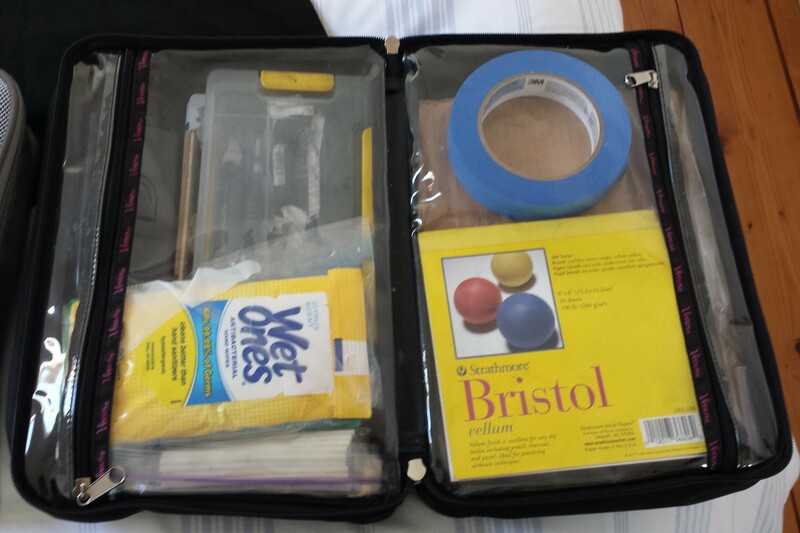 Supplies inside include a Plano box containing mediums, Wet Ones, bristol paper pad, small board, and tape. What I bring depends on where we go and for how long. • I always have a Plano 3540 Waterproof Stowaway container filled with charcoals, graphite pencils, and erasers (the waterproof seal is key to keep the charcoal dusts and pieces from slipping out), a small masonite board, blue painters tape, moleskin notebook, and some sheets of various papers. • Winsor Newton Artists’ Watercolor Sets – Artists’ Field Box Set, 4 brushes, a Sennelier Pastel Half Stick Set, and Caran d’Ache Classic Neocolor II Water-Soluble Crayons. We also have moto safety gear (helmets, gloves, coats, pants, boots). That is pretty much all we have with us. And yes, what we wore for departure was selected from the above… not additional articles. If you are interested in added any of these items to your own collections, please follow the links. When you purchase from the links on my site, it helps support me! Is there anything you bring that you know you can’t eliminate? Or is there anything I should add to my list? Please share! July 20, 2015 update: over the past 6 weeks we have mailed home or left behind many things to lighten our load including: hammock, exofficio coats, hats, gloves, scarves, shirts, pants, skirt, clarks and worn out socks. we have each picked up sandals, and I purchased a summer skirt and new dress. We are down to about 3 or 4 outfits each, running clothes and swimwear! Elimination. That is the name of the game when packing light. For years we have only flown carry-on, but this trip was the ultimate test. Forget carry-on specs; everything packed must fit in the motorcycle’s panniers. 5 weeks, 3 seasons, + art supplies, and fly fishing gear, for two people. This was a challenge even with all of my previous experience! 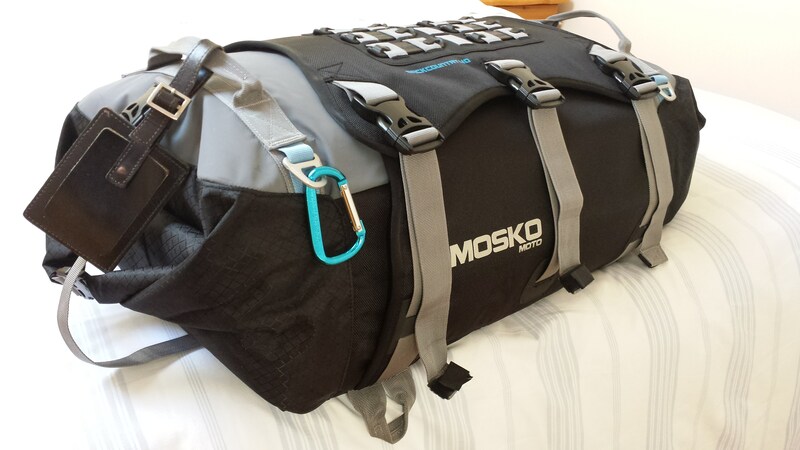 We invested in a Moskomoto Backcountry 40 liter duffle/backpack specifically designed for the back of a motorcycle. I was able to pack all of our clothes, shoes (with the exception of two pairs of hiking sneaks), toiletries, fly fishing gear, a hammock, and some supplies in this bag. We have been very happy with this bag and highly recommend it to anyone traveling by moto. It opens on both ends for access and stuffing from either side. I also purchased a 45 liter Osprey Ozone 46 which held my laptop, and some loose items I like to have access to on the plane (first aide kit, kindle, cells and headphones, notebook). Over the years I have switched to purchasing only multi-functional articles of clothing. All pieces must be light weight and quick drying. They are interchangeable and most are in UV blocking fabrics. For specifics on what we packed, read my related article. The first thing I do is lay everything out I plan on bringing, then eliminate at least half! This is easier than you think. 1. Consider the bag or suitcase you use. I have switched from a clamshell backpack style to the duffle backpack style. You really can fit so much more. I always use a backpack style. One thing I just can’t stand is tripping over wheely bags or struggling over cobblestones or staircases with them. No thank you. I am sure one day in the future my tune will change! 2. Invest in lightweight packing cubes. My favorite are by Travelon. They are super durable and have mesh tops so your clothes can breathe a little. The colors are day-glow bright which make it easier to find what you are looking for inside the dark abyss of you bag. They come in many sizes and I pack everything from clothes to gadgets inside. This keeps it all neat and tidy. I also a number of cosmetic and toiletry style bags for art supplies and gadgets as seen in the far right of the picture above. 3. 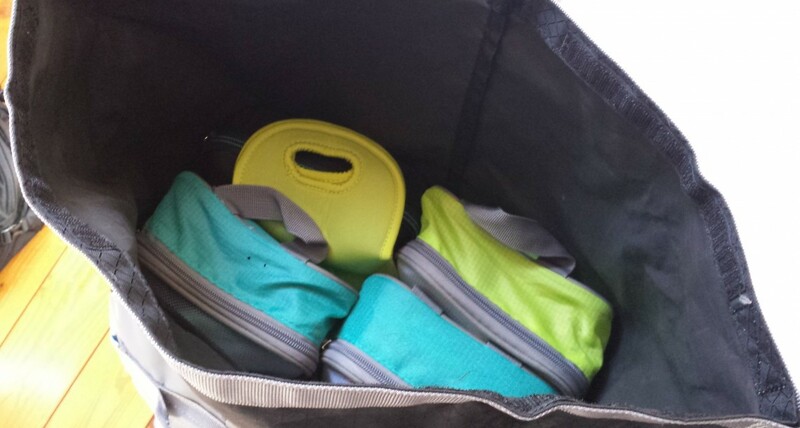 Pack your socks and small items inside your shoes. I know for many people it seems like common sense, yet I still forget to do this until half-way through packing! Also, considering rolling your socks and undies separately instead of folding them. This makes them fit just about in any left-over crevice. I use both techniques depending on where has space. Travelon Cubes are easy to pack in like puzzle pieces. I also always bring a neoprene wine bottle holder. 4. Think it through. Ask yourself this question: What will I need at the airport and will I be unpacking everything at my first destination? Keep items you will need soonest at the top of the bag. There is nothing more annoying than having your connecting overseas flight delayed and realizing your plug converter is at the bottom of your bag so cannot charge your cell without emptying everything! 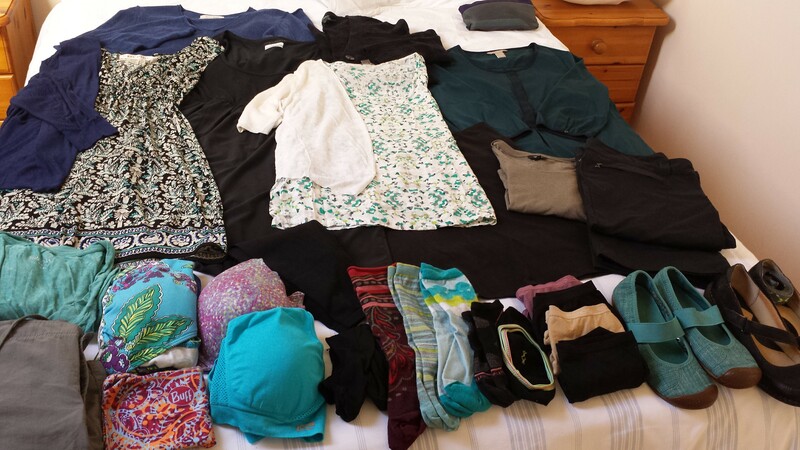 Same goes for certain items – for example arriving in Ireland, I do not need my swimsuit until 2 months later when I get to Croatia – bottom of the bag it goes. 5. Do a “mock” pack at least 2 to 3 weeks before departure. This works really well for us. For about a week straight I wear the items I plan to bring (if season is different I wear the items when hanging around the house). I find that by doing this you can easily become aware of a pair of shoes that really maybe don’t go with everything you packed, or that you really need a different pair of pants because these just don’t agree with you after the holidays…get it? !